TRIPAWDS: Home to 13647 Members and 1543 Blogs. The KillBarney Tour – Name Your Price! Name Your Price! This first volume of The KillBarney Tour is a PDF version of the 128 page special edition guidebook featuring Tripawds members around the world, and one plush purple dinosaur. Download this e-book now to start reading all about the first 32 hosts of the KillBarney Tour in just a few minutes! 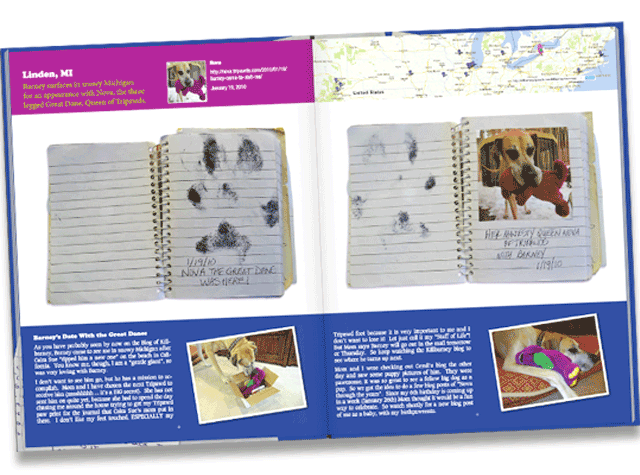 This first volume of the Tripawds Traveling Barney Guidebook reproduces the original KillBarney Tour journal in its entirety along with photos and blog entries from members describing the fun Barney had with their dogs. 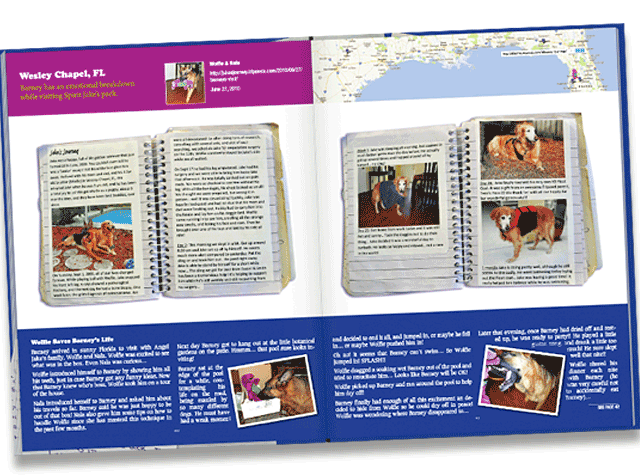 The 128 page full color PDF features photos, hand-written notes, and blog entries from Tripawds members who hosted the KillBarney Tour, from January, 2010 through June, 2012. All website links in this e-book are active hyperlinks that will direct readers to members’ blogs for more details about Barney’s adventures, and to view videos or see more photos of the little purple beast with his three legged friends. This PDF version of the first KillBarney Tour Guidebook has been optimized for printing on desktop computers or at your local copy shop. NOTE: 35 MB PDF DOWNLOAD! Please allow ample time for the file to download to your computer. 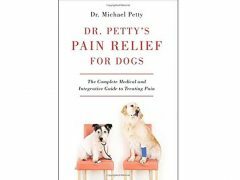 Download e-book to your device! PDFs will load in your browser by default and there is a limit of 10 downloads. Link expires in 90 days. For best results, view or print the file using Adobe Acrobat Reader. On iOS devices, save PDF to iBooks. What is the KillBarney Tour? 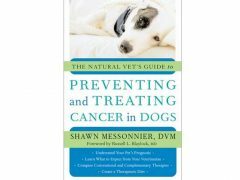 Click the Buy Now button to download this e-book. 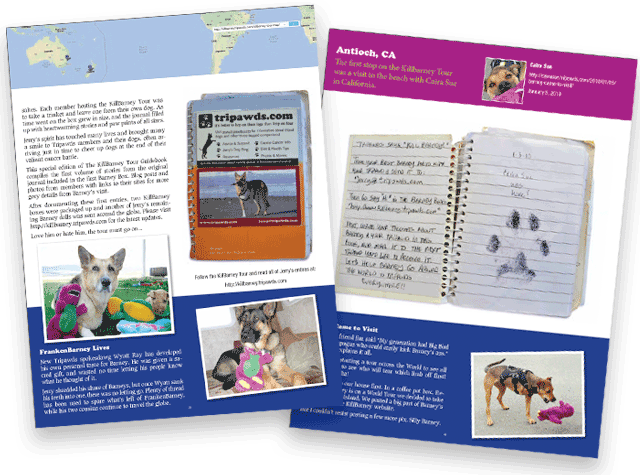 Visit the Tripawds Bookstore to preview pages or purchase the printed book. Be the first to review “The KillBarney Tour – Name Your Price!” Click here to cancel reply. Tripawds Downloads © 2019. All Rights Reserved. Tripawds Downloads is brought to you by Tripawds.